Dilute with T101 - T104 Mr. Color Thinner or T106, T108 Mr. Color Leveling Thinner. 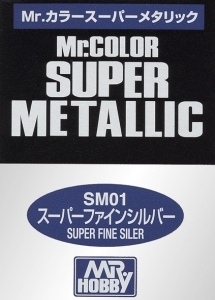 SM01 & SM06: be sure to dilute with T106, T108 Leveling Thinner. SM08: Do not need to dilute. (can be diluted with Mr Hobby Color Thinner < 20%). SM06: be sure to apply Mr. Color, or SF288 Mr. Finishing Surfacer 1500 Black as a base color before painting in order to give a metallic touch. For airbrush painting, dilute paint with thinner to a ratio of 1 paint : 1 ~ 2 thinner (excluding SM08). For further glazing, coat the surface using B513 Super Clear Gloss, etc (excluding SM06 and SM08, clear paint coating will dull the color). Stir the metallic particles well when thinning & during painting. Use an airbrush with 0.3mm nozzle or above.